Apple’s online store was down for maintenance this morning, leaving us all in wonder as to what mystery product would soon be available to purchase. Would it be a new iPad Pro? A souped-up MacBook? The mass-availability of AirPods? Not quite, but there is now a red iPhone 7 or 7 Plus! 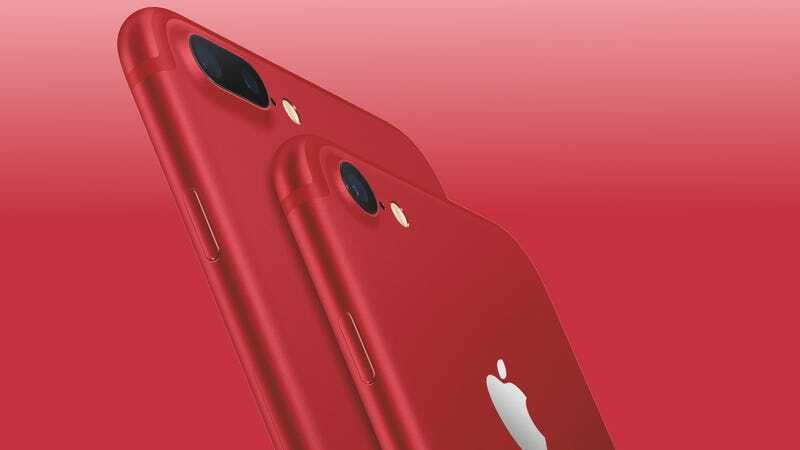 Available on March 24 in 128GB and 256GB capacities (just like the Jet Black iPhone 7), the new color is done in partnership with AIDS charity (RED), an organization Apple has worked with for more than ten years. Apple has made a bunch of special (RED) products in the past—everything from an iPod nano to an iPad case to an Apple Watch band. (In 2014 Apple even did a special promotion in the App Store where proceeds of certain apps went to the organization.) But this is the first time we’ve seen the company do a custom color for its flagship iPhone. You may recall that rumors of a red iPhone kicked off back in December, when Japanese Apple blog Macotakara got scoops from a “supplier.” For those keeping score at home, Macotakara is now three for three, correctly predicting the rose gold, jet black, and now red iPhone finishes. Besides the new phone, Apple also announced a new, cheaper 9.7-inch iPad. Dubbed “iPad,” this is a slight upgrade over the old iPad Air 2 (it now has the A9 chip, not to be confused with the A9X chip in the iPad Pro), but with a starting price of $329. As if that wasn’t enough, the company also announced a new app called “Clips” that will be out in April. From what we can gather, Clips is basically Apple’s version of Prisma, and it looks like it’s the “Apple take on Snapchat” that was rumored back in August. The goal of Clips appears to be to create stuff you can share to Instagram or Snapchat or iMessage, but we’ll have to wait to get our hands on the app to see how it stands up. As for the red iPhone itself, it’s exactly like the iPhone 7 or 7 Plus that has been for sale for the last six months. It’s just red.